While the thrust of the paper is self-evidently true, it takes a rather bogus approach. The paper uses two indicators, the temperature at the elevation of the main competition centre and the reliability of reprecipitation on surrounding mountains. The red figures in the image relates to one-or-both of these indicators falling below 75% reliability. 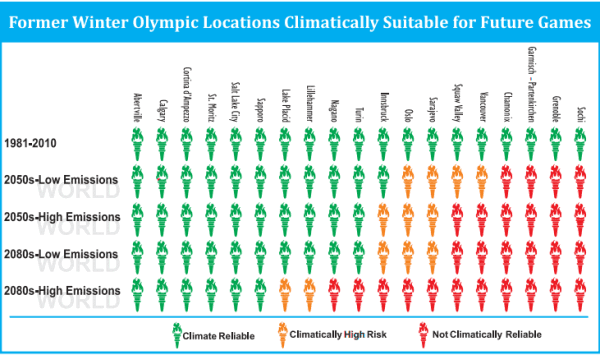 The cities that predominate at the right end of the scale are typically lower altitude and or lower latitude, and of themselves are not suitable candidates for the Winter Olympics anyway, other than their proximity to good mountain slopes. Historically, nearly all of the events in these low/low host cities are indoors and outdoor temperature doesn't matter a damn - you can ice skate in Hong Kong and Dubai. Albertville in 1992 was the last host to hold skating outdoors - the ISU now mandates Olympic competition is indoors to ensure consistency in results between venues and over the duration of a competition. Sochi itself is humid subtropical (not a million miles away from conditions in western Tasmania, but drier and more prone to extremes), and palm trees grow in the fashionable parts of town. It would be completely unsuitable as a venue except for the fact that its about an hours drive to Europe's highest mountains. Skiing is can't be indoors of course, but when events are held at up to nearly 3000m, temperature change is not going to cause problems in the next century. The issue of precipitation at skiing venues is more significant, but having been muddled with the host city temperature, the article is a bit pants, TBH. Willard Tony's dog-whistling is predictable, but frankly this press release is a waste of time. Frank, you make good points but you may be being a bit harsh on the paper. When they refer to the "main competition elevation" I figured they were referring to the area for outdoor events. This is because in indicator 1 they discuss the reason for this indicator was its effect on snow and ice, snowmaking and repairing snow surfaces. (They list several indicators they examined of which they selected the two you mentioned to cover off most of these more detailed indicators). The other indicator they used wasn't reprecipitation, it was probability of a snow pack of at least 30 cm, through natural snowfall and snowmaking. This doesn't necessarily have to relate to precipitation during Feb or even January. I'd expect this would be based on something like a combined temperature/precipitation with snow vs rain in precipitation. They point out that 30 cm is low and seem to have chosen it to allow comparison with other studies, which typically use a 30 cm snowbase threshold.